Offering a seasonal outdoor pool and sun terrace Starlight Lodge Cape Cod (formerly Briarcliffe Motel) is situated in Dennis 37 km from Provincetown. Free WiFi and complimentary private parking is available on site. Plymouth is 47 km from Starlight Lodge Cape Cod while Chatham is 20 km away. 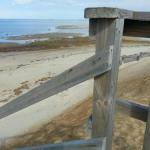 The nearest airport is Martha's Vineyard Airport 51 km from the property.